Tizzie Hall is at it again. The self-titled baby whisperer who is known for a book that she wrote PRIOR to having children of her own that instructs parents on how to get their babies into strict feeding and sleeping routines (to the point that they may become so distressed that they may vomit?! ), is now copping criticism for advocating potentially-unsafe car safety practices for babies. Tizzie, whose expertise is "based on years of my study and observation of how babies sleep" is under fire for spruiking merchandise available on her website that could possibly endanger babies if used in the way she suggests. Before I delve into this, let’s just take you back to this moment. Remember the day Prince William and the Duchess of Cambridge emerged from St. Mary's Hospital with their newborn son, Prince George, all snug in his car capsule, ready for the car trip home? Well Wills and Kate were blasted via social media because the baby Prince did not appear to be strapped into his car seat correctly. Observers noted that Prince George was still swaddled in the car seat – a big no-no as this prevents the shoulder straps from being placed around a baby’s arms correctly. 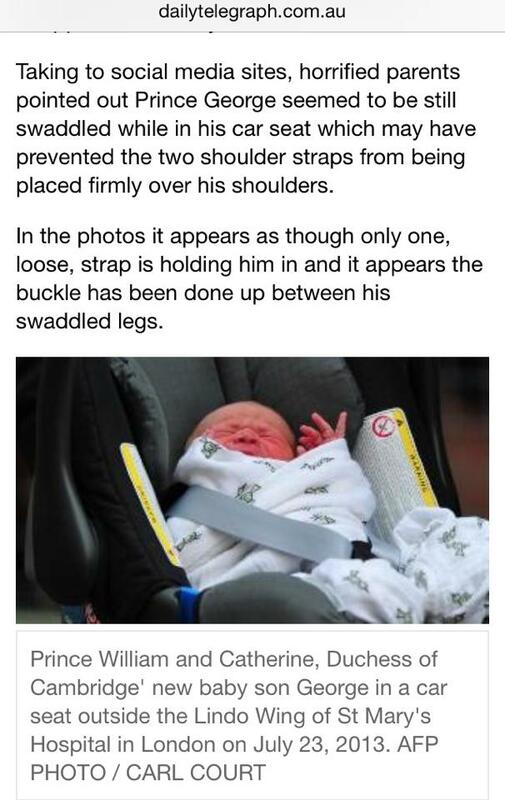 “As well, the straps weren't nearly tight enough to prevent the child from falling out. By most standards, the straps should be tight enough that only one or two fingers can fit between the child's chest and the straps,” CTV News noted. So, with that in mind, you can imagine the shock and dismay experienced by Kidsafe - the Child Accident Prevention Foundation of Australia, an independent, non-profit, non-government charitable foundation - when they discovered Tizzie Hall's potentially-dangerous advice on her online store. The important warning from Kidsafe Queensland. “Just seen [sic] VERY DISTURBING information on a website..."
"DO NOT UNDER ANY CIRCUMSTANCES wrap your baby like this in a swaddle or blanket and place in a child car seat or pram/stroller. Arms and legs MUST be sticking out of the harness straps. 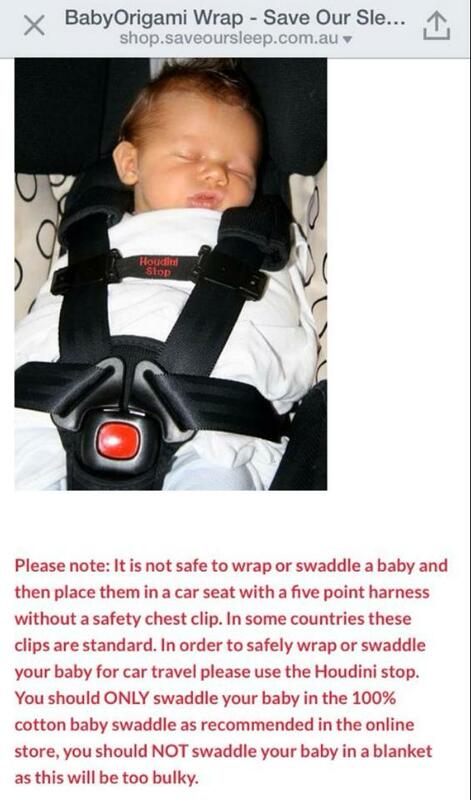 The Houdini strap is not recommended and is designed to break apart in a crash and therefore your baby could be ejected from the child car restraint or could jack knife out. The product listing on Tizzie Hall's online store advises parents to use the Houdini stop to 'safely wrap or swaddle your baby for car travel' despite the risks. "Surely there has to be some law or safety guidelines that she is breaking giving this advice. Money speaks louder than a child's safety and well being for that woman. Just so dangerous." While another, also experiencing her concern, advised that Tizzie's use of the Houdini strap, in this manner - while a baby is swaddled and is not correctly fastened - has been a cause for concern in the past. Tizzie Hall is both adored and reviled by parents for her controversial methods, with many opponents questioning her qualifications to be dishing such advice without appropriate certification/input from industry or government experts. Many new parents, in their sleep-deprived state, fall into the 'Tizzie spell' and follow her word like gospel. This is where things can get dangerous. Tizzie’s Facebook fan page appears to exist primarily for the purpose of directing people to her online store (which sells a variety of items from baby sleeping bags, blankets, swaddles, baths, swimwear and other baby items), more than actually offering any assistance. The problem I, and many other parents, have with Tizzie, is that it's dangerous for her to display an apparent disregard for safety guidelines, in favour of possibly scoring sales, and therefore putting vulnerable new mums and their babies at risk. Yes some babies may be more content when swaddled, but usually the motion experienced when driving in a car puts bubs to sleep which rules out the need for a swaddle anyway? And once asleep, many babies may transfer inside in their capsule/ from their capsule to their safe sleeping space - cot or bassinet. And some don’t. But you know what, if they're disturbed in the process, that’s could be a good thing as it's recommended that bubs spend no longer than two hours at a time in a car capsule as it can damage their spine. If it’s cold for the travel time between indoors and the car, you can easily dress bubs in more layers, whilst still ensuring the safety harness is fastened correctly. Swaddling devotees may also end up 'creating a rod for their own back' as you may have to ‘wean’ your bub off the swaddle eventually. For example, some might start with letting bub have one arm out at a time, before going cold turkey. 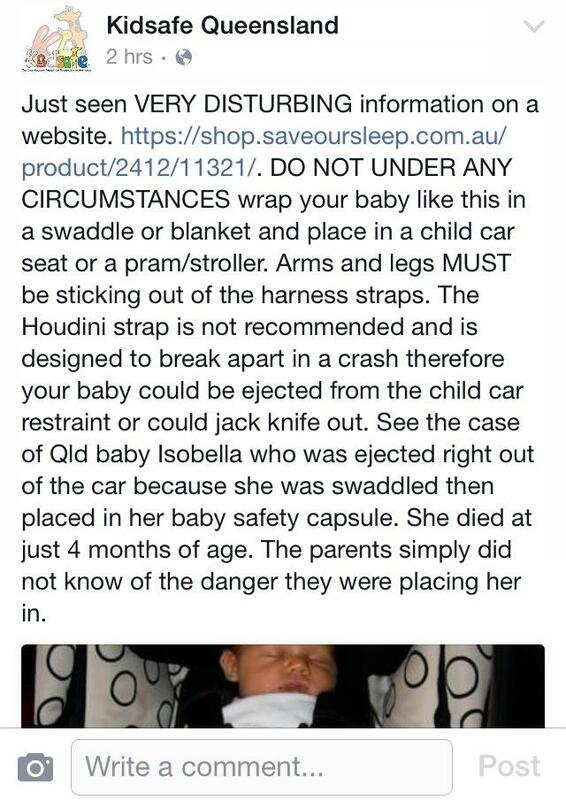 Best advice: Don't swaddle babies when restraining them in a car seat/capsule. Ensure their arms and legs are exposed for the harness to be correctly fastened. Tizzie reportedly started giving advice on baby rearing when she was 9 years old. One of her main qualifications is reportedly in baby-sitting. Many despise the advice offered by Tizzie - who wrote her well-known book before she even had kids - that reportedly includes timing your baby’s feeds, ignoring their cries/protests at bed time to the point that they’re so distressed that they may vomit in their cot. I don’t know about you, but I didn’t feel equipped with such a wealth of experience before having children (even after having my first) to write a book. Babies are all so different and you can be the best baby-sitter/nanny/Aunty in the world, but unless you're the one with them 24/7, recognising their wants and needs, breastfeeding or bottle feeding them, and getting up to them throughout the night, then you really can't comprehend what it's all about until you're there on the front line, with your own offspring, with your own hormones/instincts directing you on what to do. I don’t follow a strict, to the minute, schedule of when I eat, poop, sleep or want affection and I’m not sure that babies are familiar with the rules set out in such books and thus may not be as keen to participate in such ridiculousness. And for the record, I breastfed – ON DEMAND – my baby twins, let them feed to sleep and showed affection whenever the heck I wanted, and guess what, I didn’t create ‘manipulative’, ‘clingy’ babies, but bubs who were secure and were able to sleep through the night 10/11 hours from around 5 months old. No books or sleep training required! We followed our babies' leads and they created their own happy routine which we happily followed.Granted we also have two toddlers and the whole sleep thing was a bit of trial and error with the first, but we got there and worked out the best STRESS-FREE and TEAR-FREE techniques that worked for us and it worked. (And by the way, it's the biological norm for breastfed babies to wake frequently for feeds as this stimulates/maintains mum's supply so there's nothing wrong with bubs who do wake that should lead you to think you need a book/routine to snap them into shape to stop waking). "There is absolutely nothing for me to gain in putting babies at risk, baby safety is one of my main concerns when working with clients. I believe it is up to parents to gather information, read studies for themselves and make their own choices." "My research is my life work – 20 years + working with and watching babies of all ages sleeping. I do not have any formal research and I state clearly it is MY RESEARCH, if a parent decides that is not good enough for them to follow then of course that is their choice." Moral of the story: don't rely on one person's advice/books. Seek advice/research from a variety of sources and ensure you're safety conscious. Would you/have you ever transported your baby while swaddled? As a so-called ‘expert’ do you think it’s dangerous for people like Tizzie Hall to be throwing around such ‘advice’? Are you a Tizzie fan? *Disclaimer: Like Tizzie, I'm not a medical professional. However, as a mum of 4, I feel pretty confident when it comes to discussing all things babies, breastfeeding and sleep routines, or lack thereof, based on MY many years of research. For medical issues, please see medical professionals, child health care nurses, and Pediatricians. Pinky McKay (mentioned in this article) is another great option for parenting queries. She specializes in gentle parenting styles that honour mothers’ natural instincts to respond to their babies and empower a positive response from infants and toddlers. She’s also an International Board certified Lactation Consultant (IBCLC). You should check out her Facebook page/website for future updates. This is article is my own opinion and I have no affiliations with Tizzie Hall or Pinky McKay but am a huge supporter of Kidsafe. Purchasing a super vehicle isn't inside the range of a common man. These cars are costly and are known for its solace,supercars for sale surprising driving background, alluring appeal and complexity.